I've been obsessed with Lush products recently, especially items from their Christmas Collection. Lush always releases some of their best products around the holiday season, so definitely stop by a Lush store to check out all of the new items! I think one of Lush's best products are their massage bars, but these tend to get overlooked. I've used Each Peach, Wiccy Magic Muscles, Strawberry Feels Forever, and Soft Coeur. Midnight Massage* is the newest massage bar to Lush, which is part of the Christmas Collection. First off, I'll explain what a massage bar is. Essentially, a massage bar is a solid moisturizer that melts at body temperature. You literally just have to lightly touch these bars, and you are left with a sheen of product on your hands. I love these in the Winter, because they really pack some intense hydration. You can use these as a lotion for giving massages, or as a replacement for your regular moisturizer. I've used them both ways, and I love both! "We wanted a sensual massage bar this season, so we put in the deliciously sticky, forbidden fruits of fig, quince and carob. Combined with LUSH perfumer Simon's special "Jasmine Revolution" perfume, this is a bar that is going to make you melt! We shaped it like a Salvador Dali clock to play up the pun Midnight Mass-sage; we think it's funny!" This massage bar smells wonderful, a great mix of jasmine and fig. I think both men and women would enjoy this scent. I like to use massage bars at night, since they are very hydrating, and I like to let them sink into my skin for a bit. Another thing that I love about these massage bars is that they come without packaging - great for the environment! Lush sells metal containers for their massage bars, but you could just pop them into a tupperware or any other container you had at home. But since these do melt very easily, keep them in a cool place (not in your bathroom). You should check them out, they are amazing :) One of my favourite products from Lush! I love their massage bars - they're so moisturizing! I love a Lush massage bar - especially the ones which leave glitter all over you! 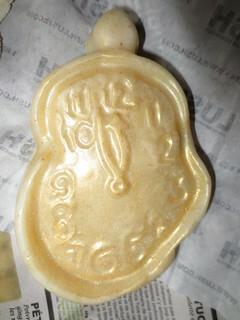 I haven't tried this one though - the melting clock idea is so cool though. I have tried Snow Fairy - I find it a bit too sweet for my tastes. Although I know a lot of people just adore it! But I'm going to get midnight massage on boxing day for sure after reading your review. Love the whimsical clock.